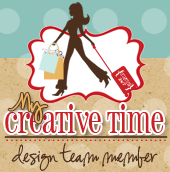 Welcome to day four of the My Creative Time Blog Hop. If you came from Liz's blog, you are in the right place. I hope you are enjoying the hop as much as I am. I get so many idea's from my fellow DT members and of course Miss Emma herself! Isn't that what it's all about? I love my crafty community!! For today's project, I thought outside of the box a little. I collected some coffee sleeves from my local coffee shop knowing I wanted to make a mini album with them. I used Emma's XL Label Die to cover the coffee sleeves using Stampin' Up Christmas paper. I glued the bottom portion of the sleeves to make pockets for journaling or more pictures. I used Emma's stamps throughout the mini. I think her stamps went perfect with them! Another great project! You are so creative. You did a fantastic job with this! Love all of the elements you added to it. This is a neat idea. I've seen people make corrugated items with the paper crimper too. Here the stores aren't so willing to give stuff away. This is a great idea. Adorable little mini.The XL die looks great on it. what an awesome idea! this book is so cute! love it! thanks for sharing. What a great idea! It turned out perfect! What a fun mini...awesome idea!! Great job!! WOW what a great idea to use the sleeves. We have a starbucks next to where I work and I'm thinking this would be a cute gift to make one with everyones name & holiday feature....thanks for the inspiration. Gorgeous book! What an amazing gift!!! Really cool idea. Good way to recyle. wow! wonderful idea and a great job! what a cute mini album! Too cute. I love the little mini book. GREAT job. I love all the details and the cute little shape. OOOH I love mini's....super cute! What a fun idea! Your mini book turned out adorable!!! What a brilliant idea,your mini album is to cute! What a beautiful mini album, Great Job. Cute mini album! It would be a great idea for a gift with a gift card to Starbucks or something. Thanks for sharing! What an adorable little mini album! Love the use of all those dies. Looks just great! What an adorable little album, great idea. Out of the box and very special. Never would have thought of this. Very creative! Very clever idea, you are so creative, I'd never think of using coffee wraps! Awesome idea! the sleeves look like a waffer cookie!! This is WAY TOOOO PRETTY my friend!!! Cute little mini book album! Your mini album is fabulous!! Super cute little mini! I love the idea of using the sleeve off the coffee cup! Great way to recycle!! How cute is THAT?? I love it!! Great idea for this mini album. Very cute. Thanks for share. What a cute idea. Never would have thought about using cup holders. That's probably because I never go to coffee shops. LOL Thanks for the inspiration. What a cute project, very clever idea. I would have never thought to use coffee sleeves. Very creative mini. Love it!!! What a cute idea! Love this. Your mini album is too cute and using coffee sleeves is such a great idea!! Love your darling mini-album. Such clever embelllishing! Awesome!! I love your mini! Nancy, your board book is super adorable!!!!! Love it! What a cute idea. Love how you put it all together. This mini is adorable!!! I have saved some coffee sleeves for just such a project!! Thanks for sharing!! Nancy, your mini album is so cute and lovely photos. Nice job!! You are very creative!! Beautiful job! I havent tried one of these yet, but this gives me inspiration! Nancy, you did an amazing job on this adorable mini! love this! Very creative. I love this mini book. Love your idea to use the sleeves...your album turned out so cute...thanks for the idea. What a cute mini album. Thanks for sharing! Very cute! Nice way of re-using those sleeves! I love how you used coffee sleeves to make a mini album. Such a cute idea. Thank you for sharing. Awesome idea! I knew I was saving those coffee sleeves for a reason! TFS! Adorable...love to recycle & reuse...Great job! very cute! I keep my coffee sleeves too and it takes everything in me not to grab more than I need at once lol. I don't want to be "that" lady hahaha. TFS! Total cuteness! I love this mini... and with Emma's stamps, it's perfect!! A coffee sleeve mini album, what super fun and creative idea!! Thanks for the chance to win. what a different idea! CUTE! What a cute idea, I have never seen this with coffee sleeves before! What a great mini! I love it! I love mini albums and this one is adorable!! love mini albums! I have yet to ever make one though!! This project is wonderful. Awesome job!!! I would never have thought of this! Great idea, the mini album looks fantastic. Oh so cute! I wanna make one! Super job, creative and very cute!! Cool mini. Love the papers you used. Awesome album, I love the coffee sleeve idea. I have a few I saved thnking of ways of using them. That is one of the cutest mini's I've ever seen! Great job! What a super clever idea for using those coffee sleeves! Fabulous job! Very cute use of coffee sleeves! Super cute mini, neat idea with the coffee sleeves. Thanks for sharing. This is GENIUS!!! You are soooo clever!! !